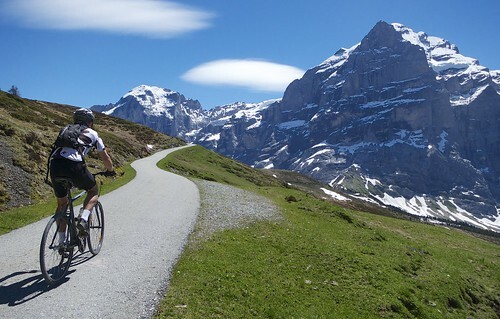 I would happily put either side of Grosse Scheidegg on any top ten list of great Alpine cycling climbs. Both sides are very challenging …. and unbelievably beautiful. This weekend I cycled the Grindelwald side (and up to First). Strangely (for me, at least), I cycled both sides last year and never blogged about it, so I thought I’d write a single post here outlining both sides. 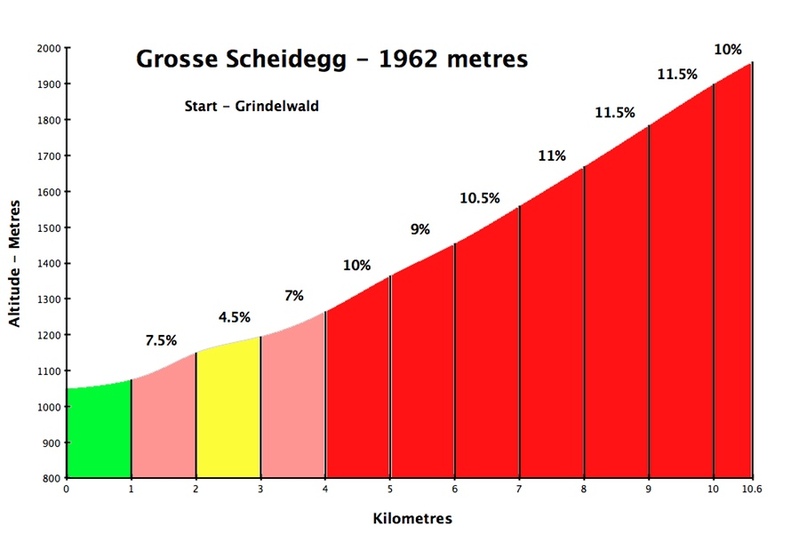 Grosse Scheidegg (1962 metres) is a mountain pass in central Switzerland linking Grindelwald and Meiringen. Located in the Berner Oberland, the climb is dominated by some of the highest mountains in Europe including the Jungfrau, as well as the renowned Eiger north face. The top part of the road on both sides is closed to car traffic, but regular Post Buses do come flying up and down every now and then. 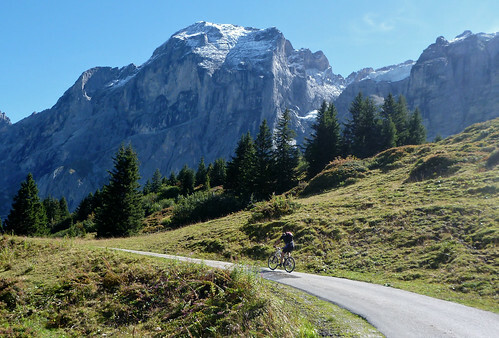 For more routes in the Berner Oberland see here. The climb is through untreed alpine pastures often with grazing cows, but it rubs up against high mountains the entire way up. There is not much more to say: it’s simply a steep, tiny, well-surfaced road to paradise. This weekend, I remembered, between gasps, to enjoy the fabulous environment. Don’t stop at the Summit! This weekend, I purposely brought a hybrid bike, so I could continue higher along one of the truly great paths I have ever pedaled. 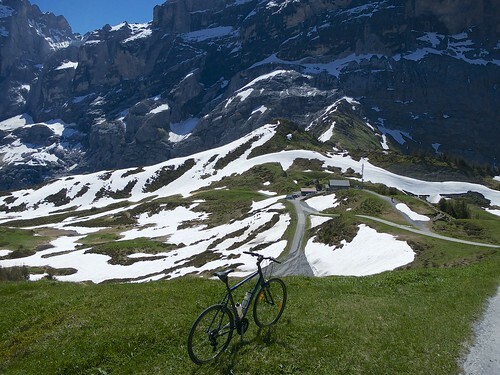 From the summit at Grosse Scheidegg there is a road along the ridge that leads to First. Some of it is paved, but much is bumpy gravel, especially the last very steep kilometre to First (2167 metres). First is at the top of a cable car that starts in Grindelwald, and lots of hikers ride up for the views and a gentle hike to a nearby lake. Cycling is forbidden past this point due to all the walkers. Perhaps it was the perfect weather or the fresh snow on the high mountains, but this is one of the most beautiful, big climbs I’ve ever done. This is a very steep climb. Starting near Meiringen, there are two possible starts: The Route 8 National route (fine for road bike) or the Route 1 national mountain bike route (some gravel / quieter). Both are steep, narrow roads through the woods and soon join up with each other (see map below). After surviving the first several kilometres, the views become staggering. High mountains and glaciers straight ahead. 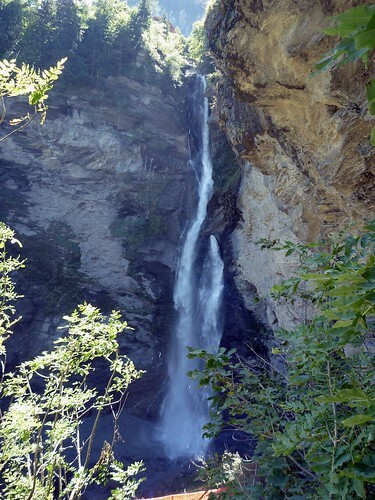 Most of the route climbs along side a mountain river – sometimes a babbling brook, sometimes a raging torrent, and sometimes an impressive waterfall (see below). After a couple of easier kilometres about half way up, the road turns up again, with probably the steepest ramp of the climb in the high teens for a few hundred metres. But the ever improving views help ease the pain in the legs. There were lots of cyclists around, some driving up and descending, some starting half way up, and the bravest starting from the bottom. At the top is a nice little restaurant and views of more mountains including the famous Eiger north face (over my left shoulder in pic below). To see details of cycling up this other – also spectacular – side to Grosse Scheidegg, from Grindelwald, see here. 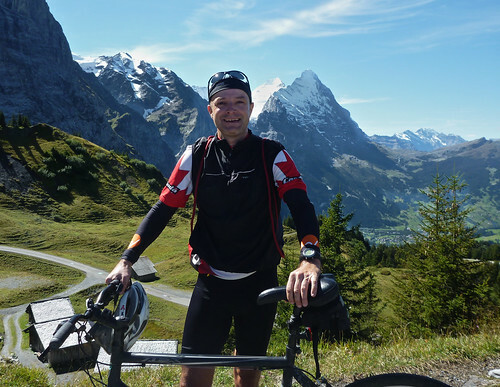 It’s possible to do a great loop, continuing down to Grindelwald, then Interlake, then back to Meiringen – best done on a Hybrid or Mountain bike to enjoy traffic-avoiding trails lower down as well as a great route alongside the Brienzer see. But I wanted to head back down the way I came and have a look at the Reichenbach falls (marked on map). This is where Sherlock Holmes was believed to have fallen to his death along with the evil Moriarty. It is a short hike from the road, with a walk to various look-out points. 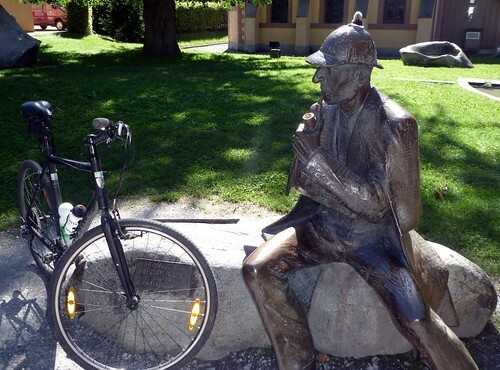 In Meiringen below, there is a Sherlock Holmes museum, statue, etc. 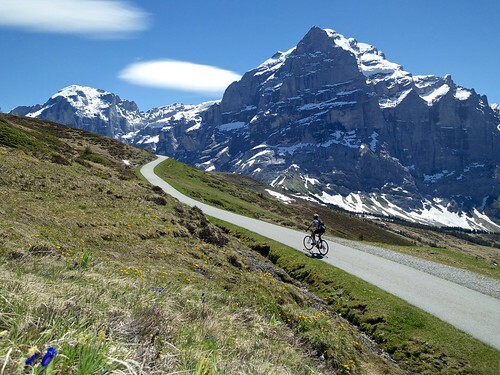 I would happily put either side of Grosse Scheidegg on any top ten list of great Alpine cycling climbs. Both sides are very challenging .... and unbelievably beautiful. The top stretches are closed to traffic. 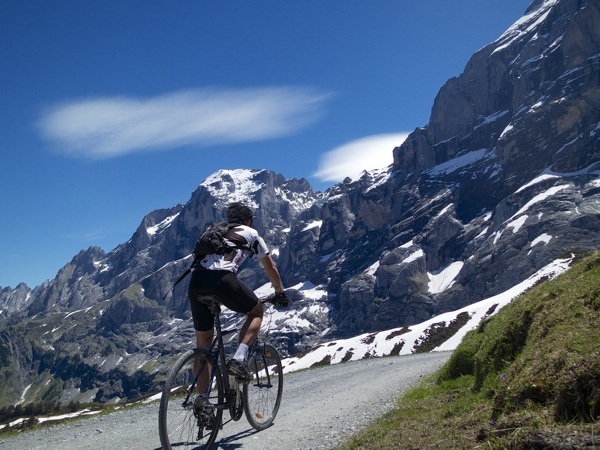 And with a mountain bike one can even go above Grosse Scheidegg for even better views. Truly Paradise. Staggering. Spectacular. Mind-blowing. 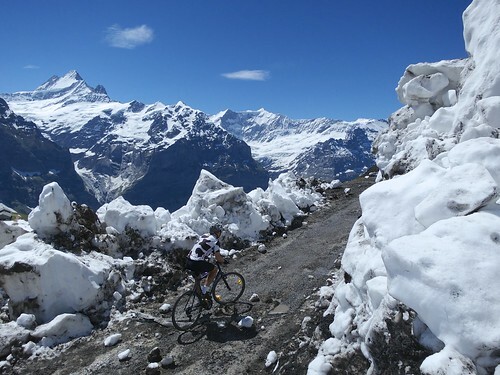 There isn’t an adequate adjective to describe how beautiful this climb is. Between the towering mountains, the carpet of thick green grass, the abundant wildflowers that will have you stopping at every switchback, this has to be one of the most gorgeous ares of the world to ride your bike. And the road isn’t bad either. 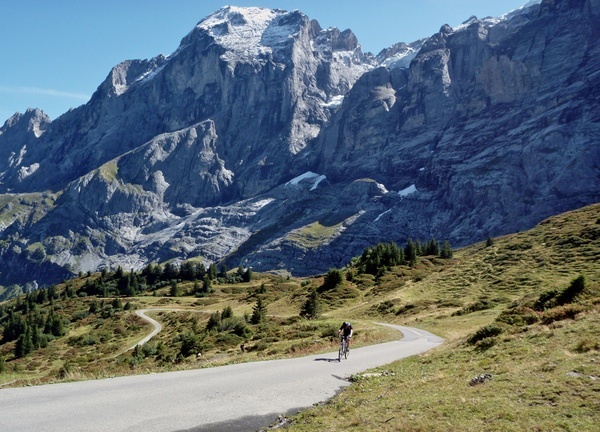 My wife and I just visited here on our honeymoon (after a week in the heart of the Dolomites), and dare I say, though the overall riding experience in the Dolomites is second to none, the scenery of Grosse Scheidegg *may* surpass that of the Sella Ronda. May. Now for the question. In July I’m going to Bormio for a week, but now I’m thinking of going back two days sooner in the direction of Belgium and make a stop in Switzerland. I would probably stay at Wengen. The main plan is to do the Silver Alpen Brevet and both sides of the Gotthard pass in those two days (what you put up here on Grimsel, Furka and Gotthard almost makes me drool). But I only have a road bike (frame only suitable for 23 mm tyres I think) and I can’t quite figure out from your pics (all with a hybrid) whether it is possible to do the largest part of this climb by road bike, and if so, which parts exactly? 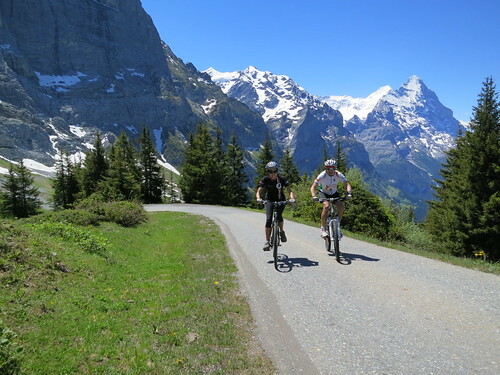 Wengen is at the foot of the west side climb, but driving to Meiringen is not a huge problem if needed. 1. 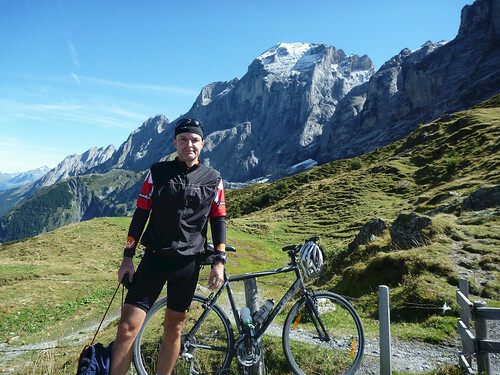 Great ideas: The Silver Alpen Brevet is a great route. As is Gotthard (the south side, north side is just “nice”). 2. Grindelwald is really the foot of the west side of Grosse Scheidegg, not Wengen. 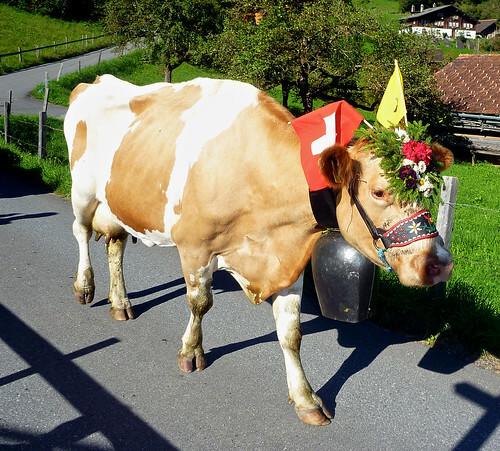 Wengen is a (beautiful) car-free village in the next valley – you take a train up from Lauterbrunnen. Although there is a VERY steep little paved path from there (I’ve only gone down it on bike). 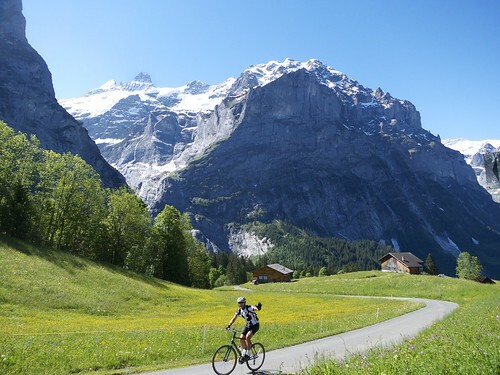 From Wengen, to get to Grindelwald, you’d take the train (or path) down to Lauterbrunnen, get on the road towards Interlaken then turn right and climb to Grindelwald – all on paved roads. It’s a good enough road for a road bike, if occasionally a little traffic. 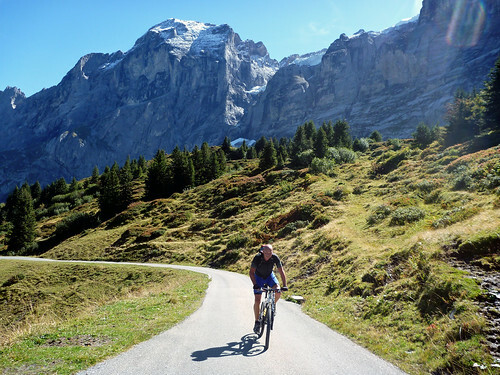 The direct way from Wengen to Grosse Scheidegg via Kleine Scheidegg is possible only on mountain bike (or hybrid) and is FANTASTIC — but not possible on 23c tires. 3. 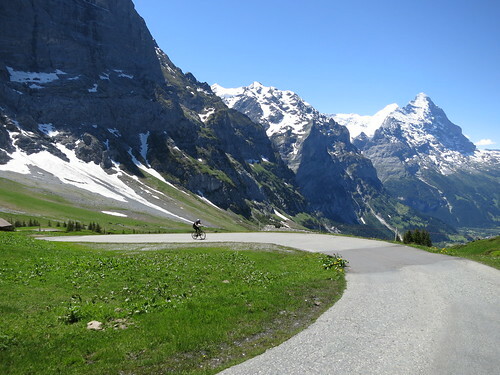 Both the west (from Grindelwald) and east (from Meiringen) sides of Grosse Scheidegg are paved. Both sides are very beautiful and worth riding. The top stretches are even closed to cars. It is one of my very favourite climbs. You will love it. 4. 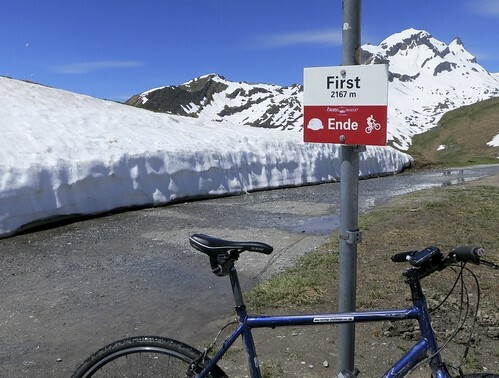 From the summit of Grosse Scheidegg, the little road that I enjoy up higher to First is generally NOT paved but in good condition – look very closely at the two top photos …. they are on this stretch. 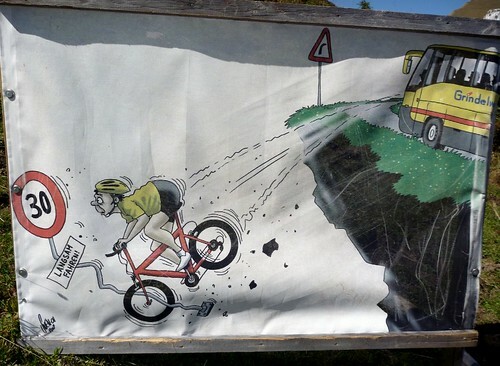 But you don’t need to do this if you have a road bike. 5. If you are interested, it is very easy to rent mountain bikes in the region. All the main villages have good (if expensive) bike stores. 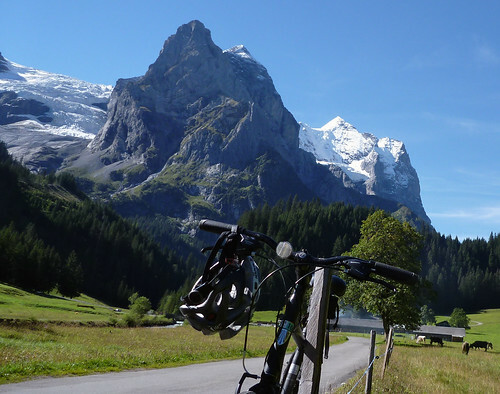 In fact, I rarely ever rent bikes but can recall doing so at Lauterbrunnen, Wengen, and Grindelwald over the years. Hope that helps, I am happy to try and answer any more questions. In Wengen. It was tough going on my Brompton!